It takes a special kind of person to devote her life not to an individual, not to a group of individuals, but to a species. Sangduen Chailertâ€”known as â€œLekâ€â€”is definitely a special person. 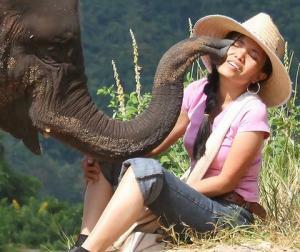 Lek is the co-founder and the on-site director of the Elephant Nature Park, in northern Thailand, a rescue and rehabilitation center for elephants. Since 1996, the park has rescued dozens of elephants, and provided a natural environment in which to care for them. Lekâ€™s day typically begins at 6:30 in the morning and continues to almost midnight. She routinely heals, feeds, and otherwise tends to 35 elephants or more, some as young as 1 and some as old as 80. She also gives weekly talks to humans, mostly in Thai but some in English, on protecting these endangered creatures. Thereâ€™s one thing Lek does that somewhat endangers her: She campaigns against â€œcrushing,â€ the stabbing, beating, and starving that handlers do in order to â€œtameâ€ an elephant. This has earned her the enmity of certain officials in the Thai government; Thailand\'s economy counts on tourism, and when foreigners are informed about how endangered animals are being mistreated, Thailand loses some of its \"romantic\" image. Lek grew up poor in a rural mountain village of northern Thailand, but she worked hard and earned a B.A. from Chiang Mai University, something rare for a woman in her circumstances. When she was a girl, her family had cared for an elephant, and Lekâ€™s relationship with that elephant led to her vision of caring for all elephants. When she saw the poor conditions that elephants were living under, that vision became a mission. â€œA whole month I have to stay with the baby elephant in his pen. The more time I spend with him, I feel that I can help him survive. Most people who first see him doubt that he survive, but I have promised myself I will coax him to health. I firmly believe that my love will heal him . . .